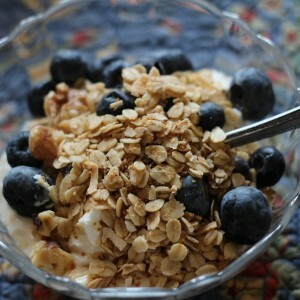 I keep homemade granola on hand as a regular breakfast option. Sometimes the same old recipe can get old and I had a bag full of bananas in my freezer that had ripened past their prime. When I ran across this recipe, I knew I needed to try it - and soon. I was searching for a cool summer morning to bake it and when it came I was wow'd by the simple pleasure of this granola. Warm the coconut oil on a low temp burner and add syrup and vanilla. Remove from heat and add the mashed banana. Spread out on a couple jelly roll pans covered with parchment paper. Bake at 350 for about 25 minutes or until browned. Scootch it after about 10 mins if you don't want granola clumps. I prefer to eat this with just a bit of milk, but sometimes frozen blueberries are the perfect addition. The kids like it with slightly sweetened plain yogurt.